I recently did a poll asking people if they are or are not going to ISSCR and in either case, why. The results (at right) are pretty interesting. 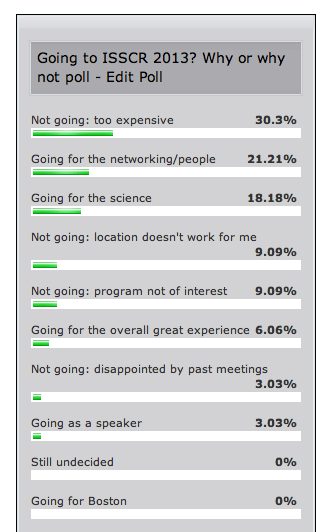 The #1 answer was that respondents were not going and the reason was that attending would be too expensive. Two other reasons given for not attending (tied at ~9%) were the location doesn’t work and the program wasn’t of interest. Considering people’s wide range of opinions of things and spread across the globe not necessarily close to Boston, I think that these results on the location are not bad news for ISSCR at all. It’s hard to satisfy everyone. On the other hand, flat out good news for ISSCR is that ~46% of people (collectively) said they were going for one of three reasons: to network, for the science or just for the overall great experience. 3% more said they were going as speakers. Only about 3% said they were not going because of disappointment with past meetings, despite a lot of grouching for various reasons about ISSCR 2012. Overall, I’d say this poll is a net positive for ISSCR, but the cost issue should be something that ISSCR addresses. ISSCR, are you listening? Almost 1/3 of people said they weren’t going due to cost. I’d say even more funding should be going for travel awards. It’ll be interesting to see the poll results post-meeting and see if they are more upbeat than what we observed last year.